In the north and northwest of Jujuy province, people are finding that solar energy, a clean and inexhaustible source, can replace firewood, which is increasingly scarce. The EcoAndina Foundation is showing the way through a series of projects. The Puna, at altitudes of 2,700 to 4,600 metres above sea level, is part of the vast Andean Altiplano shared by Argentina, Bolivia, Chile and Peru. EcoAndina’s goal is to improve living conditions for local residents by sustainably harnessing the abundant sunshine and wind, while maintaining the cultural and historic identity of local indigenous communities. Since it began its efforts two decades ago, some 400 solar energy units – which power family and community kitchens, bread ovens, heaters and hot-water tanks – have been installed in 30 towns in the region. In addition to cooking in solar stoves and ovens, which have proven as effective as gas stoves, the families now have heat and hot water in their homes. In the schools, solar panels warm the classrooms, and photovoltaic panels produce electricity. One of the projects involves developing technology to verify reductions of carbon dioxide emissions resulting from using solar ovens. Certification of emissions reductions will help gain access to carbon credits, which can be sold on the market, and the revenue would be invested in new sustainable energy devices in the Puna. The stoves, which can be used inside or outside the home, depending on the model, are manufactured in the region at low cost. The mostly widely used are the parabolic stoves, which are made with highly polished aluminium to concentrate the sun’s rays. These techniques allow residents to replace other sources of energy, particularly firewood and fossil fuels, which release carbon dioxide and contribute to climate change. In the high plains region or arid and semiarid soils and fragile and scant vegetation, replacing firewood also helps fight desertification. The altitude and dry environment mean that plants grow very slowly, and people have to travel farther and farther from home to find firewood. Studies by EcoAndina show that one solar oven reduces household firewood consumption by 50 to 70 percent. Silvia Rojo, president of EcoAndina, explained to Tierramérica that the people of the Puna region have traditionally used three types of plants for firewood: the “tola” bush, “queñoa” – a high-altitude tree – and “yareta” – a cushion-shaped shrub. But collecting these sources has led to serious desertification, the loss of species and damage to watersheds. The other choice besides firewood is propane gas, which is sold in 10-kg cylinders at high prices in this remote area. “The bottled gas costs 13 times more per cubic metre than the methane supplied by public networks in the cities,” said Rojo. “Our work is focused on offering thermal energy alternatives to firewood and gas to about 30 villages,” she said. Today the applications of solar energy “enjoy broad acceptance and high demand, which is why we are spreading the word on ‘solar villages’,” she said. To achieve that status, the communities receive training with the support of the United Nations Development Programme’s Global Environment Facility. The first “solar village” is Lagunillas del Farallón. “It is a category that gives the community a higher standing and fills it with pride, because the residents are recognised for using clean technologies,” said Rojo. The circuit is being completed with other towns, which in the coming years will be meeting their energy demands sustainably: Ciénaga de Paicote, Cabrería, Paicote, Cusi Cusi, San Juan y Oros, La Ciénaga, San Francisco, Casa Colorada and Misa Rumi. 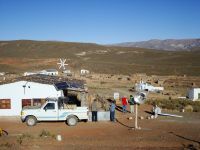 The first location where EcoAndina began its work was Misa Rumi, where a house that is completely powered by solar and wind energy has been operating since 1997 as the headquarters for fieldwork and research. The Puna is ideal for solar and wind energy. The high plain, part of the Andes mountain range, is very dry, and temperature swings are extreme and abrupt, Christoph Müller, a German expert who works with EcoAndina on technical questions, told Tierramérica. In a single day in winter, the temperature can range from 20 degrees Celsius during the daytime to 25 below zero at night. The sky above the altiplano is completely clear during most of the winter. That makes the Puna one of the areas with most sunshine in the world, along with the Bolivian Altiplano and the high plains of Tibet and Afghanistan – and an ideal site for exploring the potential of solar energy. For now, the initiatives are limited to providing energy and heat to the homes, community centres and schools, but ambitions could go far beyond this. Rojo said EcoAndina is promoting the idea of a solar generator to supply electricity to all of Jujuy province without producing greenhouse gas emissions or pollution, at nearly zero production cost. If it becomes reality, it would be the first in Latin America, though Brazil and Chile are also pursuing similar projects. “It would not be able to cover all the tiny towns in the north of the province because they are so dispersed, but they already have community photovoltaic systems in each town,” Rojo said. Are their any plans to replant some of the trees, shrubs and vegetation that has been so overused?